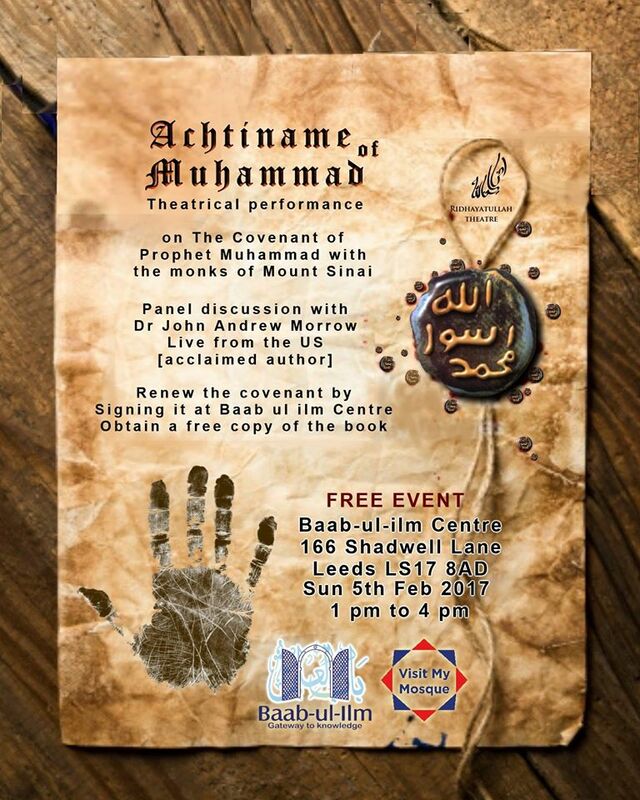 SHAFAQNA – The following key-note address was delivered by Dr. John Andrew Morrow on Sunday, February 5, 2017, at Baab ul-Ilm Mosque and Community Center in Leeds, United Kingdom, as part of a program titled “Renewing the Covenant,” organized on the occasion of Visit My Mosque Day. The event featured recitation of the Qur’an by Maulana Noorul Hasan, a welcome by Chairman Rasool Bhamani, the 40ththeatrical performance of The Achtiname of Muhammad by the Ridhayatullah Theatre Group, an acclaimed play based on Dr. John Andrew Morrow’s best-selling book, The Covenants of the Prophet Muhammad with the Christians of the World, which was adapted for the stage by Ali Panju. The complementary showing of the theatrical performance was followed by a keynote address by Sheikh Arif Abdul Hussain, the founder and director of the Al Mahdi Institute in Birmingham, who focused on the universality at the heart of the spiritual traditions of the world, as well as a keynote address by Dr. John Andrew Morrow. Dr. John Andrew Morrow completed his PhD at the University of Toronto where he acquired expertise in Hispanic, Native, and Islamic Studies. He pursued post-graduate and studies in Arabic and has completed traditional Islamic seminary studies at the hands of a series of Sunni, Shii, and Sufi scholars. ” A‘udhu billahi min al-Shaytan al-rajim. Bismillah al-Rahman al-Rahim. Alhamdulillahi rabb al-‘alamin. Wa salatu wa salam ‘ala ashraf al-mursalin, Muhammad al-Amin, sayyidina wa habibina wa nabiyyina, wa ‘ala alihi, al-tayyibin wa al-tahirin, ila yawm al-din. I take refuge in Allah from Satan, the Rejected. In the Name of Allah, the Most Compassionate, the Most Merciful. Praise be to Allah, the Lord of the Worlds. May peace and blessings be upon the best of the messengers of Allah, Muhammad, the Truthful and the Trustworthy, our master, our beloved, and our prophet, and upon his family, the good, the pure, until the Day of Judgment. I send you greetings of peace: al-salamu ‘alaykum wa rahmatullahi wa barakatuhu and the warmest of welcomes: ahlan wa sahlan. I would like to thank the Ridhayatullah Theatre Group for producing a precious play based on my book, The Covenants of the Prophet Muhammad with the Christians of the World, a work that has been referenced in approximately 500 articles, reviews, and interviews, over the past three years, and which has inspired an international Muslim movement, the Covenants Initiative, which is committed to protecting the People of the Book, Shiites, Sufis, traditional Sunnis, and anyone else who is persecuted by Takfiri terrorists at home and abroad. The Covenants Initiative, which calls upon Muslims to abide by the treaties that the Prophet, peace and blessings be upon him, concluded with the People of the Book — Jews, Christians, and Zoroastrians — has been signed by hundreds of leading Muslim scholars, academics, and activists, as well as many mosques, associations, and international organizations. The Covenants of the Prophet Muhammad with the Christians of the World inspired the Genocide Initiative which played an important part in the passing of the Fortenberry in the US House of Representatives; a resolution that charges ISIS with genocide, war crimes, and crimes against humanity. The Covenants of the Prophet Muhammad with the Christians of the World helped inspire the Marrakesh Declaration on the rights of non-Muslim minorities in Muslim-majority states. The Covenants of the Prophet Muhammad with the Christians of the World helped inspire the creation of an information center, at the heart of the Organization of Islamic Cooperation, which is devoted to counter-radicalization. The Covenants of the Prophet Muhammad with the Christians of the World has been warmly received by Pope Francis, Patriarch Theophilos the Third, Patriarch Bartholomew, and the Holy Council of Fathers from St. Catherine’s Monastery at Mount Sinai. The book in question is being provided, free of cost, to the Muslim 500; namely, to the 500 most influential Muslims in the world. The book in question has been translated into Spanish and is slowly making its way into the hands of Roman Catholic clergy in the Hispanic world. The book in question has been translated into Italian and is slowly making its way into the hands of Roman Catholic clergy in Italy. The book in question has been translated into Arabic and will be provided to the 500 most influential Arabic-speaking scholars in the Muslim world. Insha’ Allah, God-willing, all of the Grand Muftis of the Sunnis will receive copies as will all of the Grand Ayatullahs of the Shiites. I am pleased to announce that the Six Covenants of the Prophet, peace and blessings be upon him, will soon be published in English, French, Spanish, Portuguese, Italian, Dutch, Russian, Turkish, Arabic, Persian, Urdu, Tamil, and Bahasa Indonesian by Cambridge Scholars Publishing. Consequently, the Muhammadan Covenants will soon find their way into libraries around the world in the major languages of the world where they will be available, for generations to come, to students and scholars alike. I am also pleased to announce that Islam and the People of the Book: Critical Studies on the Covenants of the Prophet will, insha’ Allah, God-willing, be published later this year in the UK. The work features over thirty studies on the treaties of the Messenger of Allah, may God shower him with countless blessings and grant us his intercession, authored by an international team of leading Muslim scholars. This is a two-volume reference work that is over one thousand pages long. May it serve as a source of guidance. Amen. Ilahi amin ya rabb al-‘alamin. The Covenants of the Prophet Muhammad with the Christians of the World has inspired a museum exhibit titled “Muslims, Christians, and Jews: An Exhibit of Covenants and Coexistence” organized by the International Museum of Muslim Cultures, based in Jackson, Mississippi. Insha’ Allah, God-willing, this half a million-dollar exhibit will tour from museum to museum throughout the United States and abroad. Last but not least, the Covenants of the Prophet Muhammad with the Christians of the World has also inspired a play, The Achtiname of Muhammad, which has received rave reviews, and which revives a long and rich tradition of Islamic theatre. Believe it or not, the Western world used to turn to us, Muslims, for art, culture, literature, and science. Now, by and large, Muslims merely turn to Hollywood or Bollywood in search of entertainment. Let’s stop being imitators and start being creators and innovators. Let’s be leaders and not followers. Young Muslims! We are counting on you. Rise to the occasion. The Ummah of Muhammad needs you. You are the foundations of a New Future. I have viewed segments of this performance on several occasions and have been both pleased and humbled. The script, the directing, the staging, the set, the music, the lighting, and the acting, are all, in my expert opinion as a literary and theatrical critic, admirable. Let’s send a loud salawat to everyone involved in this inspiring project. Salawat ‘ala Muhammad wa ali Muhammad. May peace and blessings be upon the Prophet and his Family. So alhamdulillah wa shukralillah, praise be to God and thanks be to God, that the Covenant of the Prophet, the Achtiname of Muhammad, is being revived during these dark days of Daesh, Boko Haram, al-Shabab, and similar psychopaths and alhamdulillah wa shukralillah, praise and thanks be to God, that the Covenant of the Prophet is being resurrected during these dark days of Donald Trump and other right-wing racists and fascists who have suddenly been rebranded as nationalists. We live in a world of extremes and a period of profound polarization. On the one hand, we have ultra-liberal, anti-religious, globalist, modernist, secularists. On the other hand, we have radical, religious fundamentalists, nationalists, and extremists. The political pendulum has certainly swung. The proponents of liberalism, globalization and demoralization are facing defeat and are in full retreat. The proponents of conservatism, nationalism, populism, and reactionism are making aggressive inroads. Although many Muslims view Western politics as a choice between evils, they are as foolish to put their faith in the left as they are to put their faith in the right. It is as foolhardy to side with amoral liberals as it is to side with immoral conservatives. As Muslims, we must always stand up for the primordial ethical principles that have been passed down by all the prophets and messengers of God. Who would have thought that we, Muslims, partisans of the Prophet and proponents of true, traditional, civilizational Islam, would find themselves as the voice of moderation amid two extremes that threaten both people and the planet that provides for them. As disheartening as social, political, and economic developments may be, it is heartening to know that young, committed, Muslims, continue to spread beauty despite the ugliness that surrounds us. Although the Muslim world soared to unprecedented heights from the 7th century to the early 20th century, the collapse of Islam as a political power has been devastating, pushing some people to place faith in Political Islam, Islamism, and Jihadism, with the vain aim of reconstituting the Caliphate. As we have seen in Somalia, Nigeria, Libya, Syria, Iraq, and beyond, their naïve dream has become a nightmare. Although Muslims can, and must, strive to create societies that are rooted and guided by the principles of the Prophet, Islam is not limited to politics. Islam is built from the bottom up: not top down. As we read in the Holy Qur’an: “Allah will not change the condition of a people until they change what is in their hearts” (13:11). The Prophet, peace and blessings be upon him, did indeed create an Islamic State, a Muslim State or to be precise, an Ummah or Confederation; however, it was not the first thing that he did. The Messenger of Allah, ‘alayhi salawatu wa salam, blessings and peace be upon him, prepared the foundations of that future state by creating a civil society. After the triumph of the Islamic Revolution of Iran, Imam Khomeini was approached by Islamists who asked him to assume the title of Caliph and to describe his system, not as an Islamic Republic, but as a Caliphate. He refused point blank. And the Sunni Islamists withdrew their support. Imam Khomeini had no delusions. He knew full well that the only people who were authorized to reinstitute the Caliphate or Imamate and the only people who were authorized to create the Government of God on Earth were the Prophet Jesus and Imam Muhammad al-Mahdi, may Almighty Allah hasten their reappearance. O our Master, O Master of the Time! Rescue me! Rescue me! Rescue me! This moment! This moment! This moment! Although the Muslim world was once a star-studded sky, it is only a fragment of what it once was. Fortunately, there are a few twinkling stars that remain, and one of those is the production of this play, The Achtiname of Muhammad. For many of us, both scholars and laypeople, the Covenant of the Prophet came as a surprise, and a welcome one at that. Time and again, people ask: “Why have I never heard of this before?” Even ‘ulama’, Muslim scholars who studied for thirty years in the hawzah ‘ilmiyyah or Islamic Seminary ask this very same question. The answer is simple: neglect. It is simply not part of the curriculum that is focused, overwhelmingly, on fiqh, jurisprudence, or personal applications of religious practices as opposed to administration of society. The Prophet Muhammad, sallalahu ‘alayhi wa alihi wa sallam, may peace and blessings be upon him and his Family, had an ambitious plan and an enlightened project for this Ummah. He wrote a constitution, the Covenant of Madinah, the first of its kind in the history of humanity: a veritable milestone. He established clear rules of governance that form the foundation of Islamic law and jurisprudence. He formulated domestic and foreign policies in the Covenants of Protection that he provided to Jews, Christians, Zoroastrians, and other communities. These are full-fledged Charters of Rights and Freedoms. The Messenger of Allah, peace and blessings be upon him, prepared to shoot a socio-economic and political rocket into the future. Unfortunately, at the very moment he launched it, a power-hungry party pushed the projectile off-course. Although the rule of Abu Bakr, ‘Umar, and ‘Uthman was relatively close to that of the Prophet in terms of the manner in which they treated non-Muslims, it swerved, ever so slightly, from his sublime Sunnah. When Imam ‘Ali, may Allah be pleased with him, assumed his rightful role as Caliph, he made every attempt to correct the course of the rocket: however, as he himself admitted, the damage that was done by the previous rulers was permanent and the common people were not prepared to be straightened. As the distance between the Prophet, peace and blessings be upon him, and the projectile increased, so did the divergence in its direction. Over time, the rocket moved more and more off course. At times, there were relatively righteous rulers, who tried to steer the projectile toward its ultimate target and goal. The Ottomans, for example, placed the Covenants of the Prophet at the heart of their legal system. Ultimately, however, the Young Turks, who were ultra-nationalist secularists at the service of the Western world, decided to destroy the missile, decisively destroying the Ottoman Empire in the process and effectively ending the political power of Islam in the world. The consequences were cataclysmic. We have not ceased to suffer since. As Sunni scholars themselves admit, righteousness left the Ummah with the end of the rightly-guided Caliphs. Shiite scholars would also agree. After Imam ‘Ali, peace be upon him, the First Imam and the Fourth Caliph, we had a succession of kingdoms, dynasties, and empires, directed by kings, monarchs, and emperors. Since there were no truly rightful political rulers after Imam ‘Ali, may Allah bless his radiant countenance, Shiite Muslim scholars focused on all the other subjects that are taught today in Islamic seminaries. Since Islam was not truly the law of the land, the treaties and covenants of the Prophet, ‘alayhi salawatu wa salam, blessings and peace be upon him, were sidelined as irrelevant to the time and inapplicable. Where Shiites did hold power, in Persia for example, during the Safavid dynasty, we see several Shahs recognizing, renewing, and implementing the Covenants of the Prophet. Shah ‘Abbas the Great, the Fifth Safavid Shah, who died in 1629, officially renewed the Achtiname of Muhammad. So, don’t buy this baloney that the Covenant of the Prophet is a forgery and that it is not part of Muslim Tradition. The Achtiname of Muhammad is cited in part or in whole in over 179 sources from the 7th century to the 21st century. It has been authenticated by thousands of Islamic legal authorities, mujtahidun and muftun, over the ages. It was also identified as genuine, re-issued, and renewed by the rightly-guided Caliphs, many of the Umayyads, ‘Abbassids, as well as all of the Fatimids, the Ayyubids, the Mamluks, most of the Safavid Shahs, and all of the Ottoman Sultans. The Covenant of the Prophet Muhammad was once common knowledge to most Muslims, most Christians, and most Jews. Ah, but the times they do a-change. With the advent of Western colonialism and imperialism in Africa, North Africa, the Middle East, the Indian Subcontinent, and Southeast Asia, Muslims no longer ruled themselves. As conquered people who were ruled by Europeans, the Covenants of the Prophet were of little consequence. What is more, these very imperialists destroyed the educational system in the Islamic world leading to unprecedented levels of illiteracy so much so that many Muslims lost touch with their own religious tradition. When the imperialists were forced to leave, they left behind their lackeys: kings, sultans, despots, and military dictators who ruled in the only way they knew: the way that they had been ruled by European occupiers. The leaders of the Muslim world are the illegitimate offspring of colonial masters. The political, economic, social, and legal systems that we see in the Muslim world were all instituted by Western Europeans. That’s their legacy. In the decades and centuries that passed, the Western world has evolved. The problem with the Muslim world is that much of it is stuck in the past: in a colonial past. Some of it has one foot in 7th century Jahiliyyah or Ignorance and another foot in 21st century Jahiliyyah or Ignorance. And yet some of it is more Westernized than the West. “Why haven’t we heard of the Covenants of the Prophet before?” The answer is obvious: it is as plain a day. We have not heard of the Covenants of the Prophet because we have not ruled ourselves according to the method of the Prophet. In some parts of the world, like the former Ottoman Empire, traditional Islamic rule only disappeared one hundred years ago. You have no idea how much damage was done. We are still picking up the pieces. In other parts of the world, such as India, Muslims have not lived according to traditional Islamic rule for several centuries. No wonder there is so much ignorance when it comes to how we should rule ourselves and how we should treat the minorities in our midst. The destruction of the traditional educational system in the Muslim world created a void: that void was filled by a new ideology: Salafism, Wahhabism, and Takfirism, spread by means of billions of Saudi petro-dollars. We may not have billions and trillions at our disposal. But we have one thing that these enemies of God and humanity do not have: faith, truth, and constancy. Bi haqqi Muhammad wa alihi al-tahirin! By the Most Compassionate! By the Most Merciful! And may the peace and blessings of Allah be upon you all.